What side view do you see? This applet consists of 20 problems. Each time one object is shown with one side view. You have to ?guess? from what direction the side view is taken. The 3D object is an interactive one: you can rotate the object on your screen using the mouse. This enables you to find out from which direction the side view was drawn. Abstract This applet consists of 20 problems. Each time one object is shown with one side view. You have to ?guess? from what direction the side view is taken. The 3D object is an interactive one: you can rotate the object on your screen using the mouse. 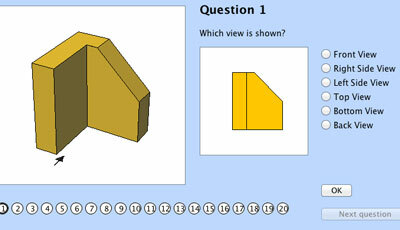 This enables you to find out from which direction the side view was drawn.